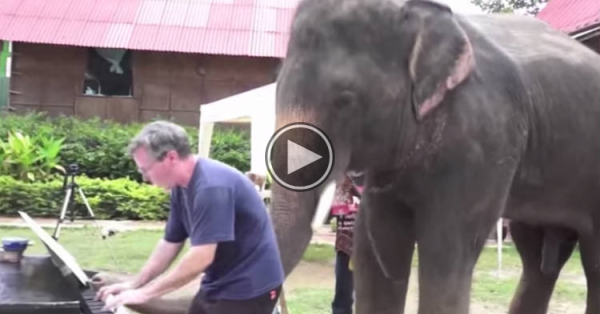 When This Elephant Heard Music, He Walked Over And Did Something That Surprised Us All. Elephants are truly amazing and beautiful animals. They say that elephants have amazing memories, but this video is proof to me that elephants are extremely intelligent animals. Watch what happens as a gigantic elephants gets very close to this man as he is playing the piano. I never expected something like this to happen. WOW! It all started when the employees at Elephant Stay, an elephant sanctuary in Thailand, were curious about how the elephants would respond to live music. That’s when they decided to set up a piano and start playing. Watch what happens when this elephant hears the music. The beautiful animal can’t help but join in on the fun and ends up playing a duet with the man. Would you ever consider visiting a place like Elephant Stay? Sound off in the comments, and be sure to SHARE with your friends on Facebook!